To my eyes, the Pistons have run one set play more than any other this season. 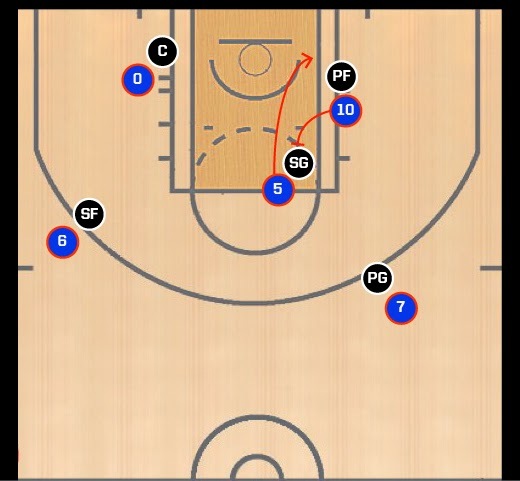 It is designed to get deep post position for one of the Pistons' frontcourt players, typically Greg Monroe, and while it usually accomplishes this, it puts other strains on the Pistons offense and emphasizes the personnel issues at play with Detroit's lineup. The play happens almost exclusively on the right side of the floor. Brandon Jennings brings the ball up the court and stops at the the break on the right. Kentavious Caldwell-Pope and Greg Monroe are typically bunched together in the lane with KCP further from the basket. Drummond is positioned on the weakside of the court and Josh Smith is usually a floor spacer on the opposite wing. The play begins with Monroe setting a down screen for KCP in the lane. KCP always uses the screen and dives to the basket before turning toward the right corner. Rather than using this screen to any effect, KCP stops before leaving the paint and sets a screen on Monroe's defender while Monroe slides into deep post position. Once Monroe is through the screen, KCP immediately runs to the weakside corner. Jennings now enters the ball into the post for Monroe who is free to attack as he sees fit. Jennings and Smith will occasionally dive through the lane, but Drummond stays planted to the weakside of the paint. 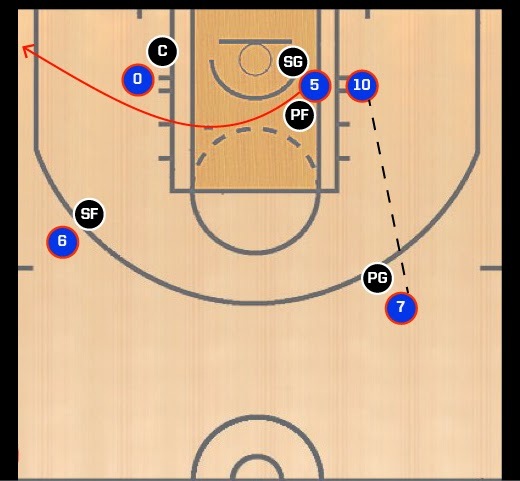 In reality, this play presents the Pistons with far more problems that it does advantages. The shot clock. The Pistons are one of the slowest teams in the NBA, which is not an inherently bad decision. They have an excellent post player in Monroe who, when given time to operate, is an exceptional passer for his position and can attack his defender with a number of post moves. A persistent problem with the Pistons' offense this season is that they don't actually get into these sets until only 10 seconds are left on the shot clock. By the time Jennings brings the ball beyond the timeline, there are typically only 17-20 seconds left on the shot clock. KCP and Monroe must then get into the proper position, and KCP is asked to set a solid screen on a player several inches taller and dozens of pounds heavier than him. He's rarely very effective for obvious reasons, so the painted area becomes a garbled mess of players that Jennings would be stupid to pass the ball into. It's only when Monroe is finally set that he can receive the ball. With the shot clock hovering around 10 seconds at this point, Monroe has to rush his offense and can't properly manipulate the defense. The switch never happens. One of the potential benefits of this set play is to get a switch in the post. Having Monroe matched up with a shooting guard in the low post seems like a guaranteed basket or at least a way to force the defense to over help. The problem is, because of the aforementioned clogging of the lane and KCP's reasonable inability to set a solid pick on a power forward, the Pistons never get the ball to Monroe in time to force the defense to switch. In addition, KCP running to the weakside corner gives the shooting guard time to recover and doesn't stress the power forward. Having KCP run to the top of the key might be a good counter to this setup, and one that requires the opposing big man to follow a shooter to the perimeter. The spacing doesn't really work. If the Pistons run this set with their starting five, the spacing doesn't work. It forces Smith to the perimeter where he has to act as an outside shooter. KCP in the weakside corner is cut off by Drummond's defender. Occasionally Drummond will drift to the top of the key in order to open a skip pass to KCP, but that's a dangerous pass for Monroe and makes Drummond's presence far less intimidating. There's no other action. One of the problems with Loyer and Cheeks last year was that they didn't design enough action off the ball. This creates the same issue: the Pistons are running a play to isolate Monroe. Worse, they're isolating him with limited time on the shot clock. Once Monroe receives the ball, the Pistons stand and wait for him to make his move. Why not have Smith set a pin down screen for KCP to curl back into the lane? Why not have Drummond set screens at the top of the key for Smith or Jennings? There are plenty of options that aren't being executed right now. Perhaps Stan Van Gundy has these in his toolbox and is rolling them out slowly, but this play seems willfully prohibitive. Van Gundy has brought precious little in the way of advanced schemes this season. What he has shown has been more coherent than anything the Pistons have run in the previous seasons, but whether the problem is that the players not executing or the schemes putting the team in bad positions, a problem still exists. I'm cautiously optimistic that SVG is slowly implementing his schemes and making sure that the Pistons can execute what they've been assigned, but after 12 games, the lack of schematic development has been alarming. Patience is afforded, but SVG needs to start showing something new in the coming stretch of games before eyebrows are raised.